Back before life was crazy with two kids, I took cake decorating classes through Wilton at a local craft store. My grandmother instilled a love of cakes in me and this seemed like a fun hobby to pick up. Over the years, I've done several Disney themed cakes (and many that weren't). I'm no professional, but it has been a skill that has come in handy at birthday parties and special events throughout the years. 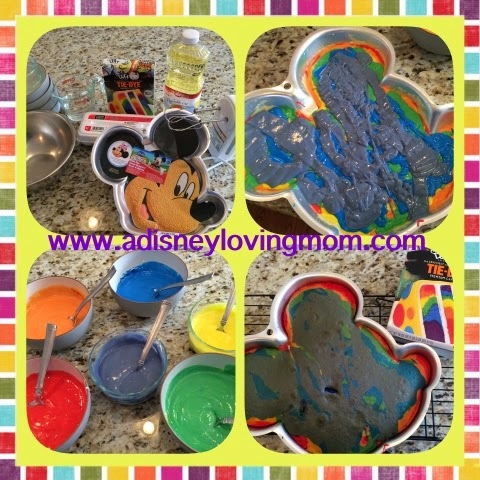 For our #DisneySide @ Home Celebration, we received a Mickey cake pan and some Duff Goldman Tie-Dye Cake Mix in the box. 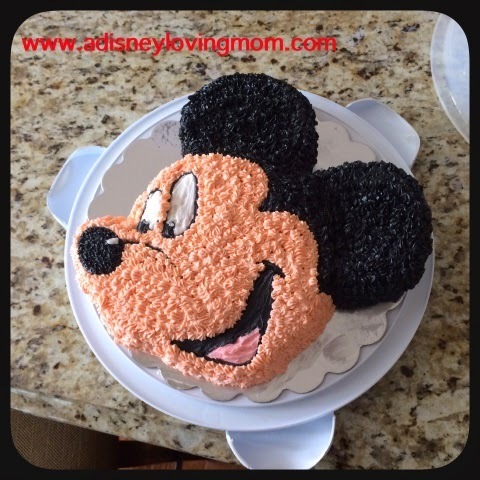 This was the first time I used the Wilton Mickey pan and Duff Cake Mix and have to say, I had a blast with both! 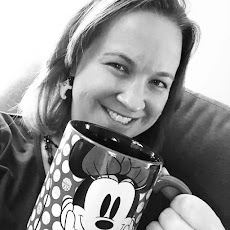 For those of you who aren't familiar with the cake decorating world, Duff Goldman is a renowned cake decorator who happens to be right down the road from me in Baltimore. He owns Charm City Cakes and gained fame beyond Maryland thanks to his own TV show. He has released several different cake mixes that are funky and fun as well as some cake decorating supplies that let you show a unique side through your decorations. 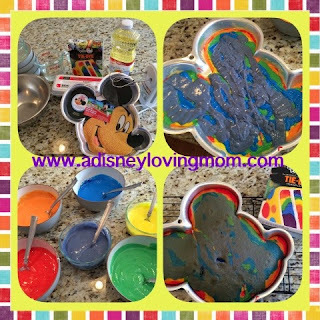 His tie-dye cake mix was both fun an festive for our Disney party. The cake itself was easy to make. It's a white cake mix that you divide into six different bowls once it's you have it prepared. Then you use his supplied food coloring to color the mix into six different colors. I successfully colored the cake batter with only a small mess on my hands! Then the box gives you different options about how to layer the colors to achieve a tie-dye look. Since we were doing a shaped cake pan, I started with red and drizzled all of it in the pan. Then followed the same with orange, yellow, green, blue, and purple. The great thing with a tie-dye cake is that there is no wrong way to drizzle the colors and design your cake! It baked perfectly in the Mickey pan in 35 minutes. After letting the cake cool on a rack for about 20 minutes, I turned it onto a cake board and let it cool the rest of the way. I used a baking spray in my pan to make sure it released easily from the pan. When the cake was cool, I "dirty iced" it with a thin layer of my homemade buttercream white icing to seal in the moisture and smooth out any crumbs. I then used the Wilton icing colors to color cake icing for my Mickey design. I had all the icing colors and decorating tips I needed to successfully go from a naked cake to Mickey Mouse in about 90 minutes. Overall, the cake was fairly easy to put together from start to finish. The hardest part on party day was keeping my 3 year old off of it until the guests arrived. Thanks again to all the sponsors who helped make our #DisneySide @ Home Celebration a big success! 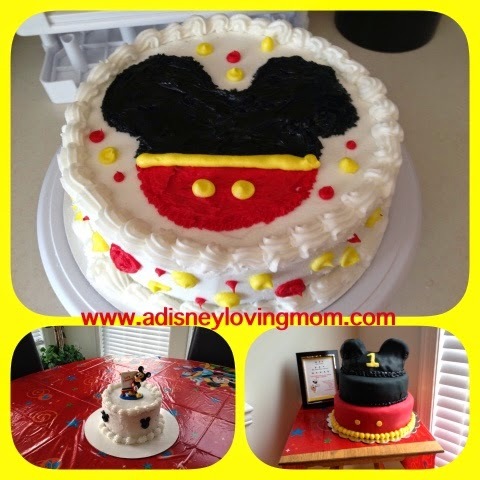 For more ideas on how to add some more Disney to your next party, visit www.disneysidecelebrations.com and follow the hashtag #DisneySide on Social Media.